Well that's not really the question, but I thought of it while writing this week's entry. 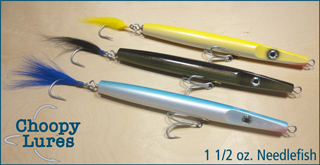 I was writing about the process to make a 1 1/2 oz needlefish. Then I decided to make a contest out of it. There's never a bad reason to give a plug away, and this seems like a good enough excuse. So on the right sidebar of the page, you will see a poll. Guess how many steps it takes to make a Choopy 1 1/2 oz. needlefish. Unfortunately the poll is private, so I can't see how you voted, so leave a comment to this blog entry with how you voted, and I will randomly select a winner from the correct selection on Monday 4/9 at 9:00 am. Next week I will finish writing about all that is involved in making a needlefish. Because I know the suspense will be killing you. I guessed 11 - 15.